The most commonly used scores, FICO and VantageScore, run from 300 to 850. Good (690 and up) or excellent (720 and up) scores give you better choices and save money. This article contains information customized for NerdWallet members. Not a member yet? Sign up today for a free credit score and see how NerdWallet can help you make all the right money moves. When you check your credit score, you’ll probably want to know what the three digits mean and find out how you compare. 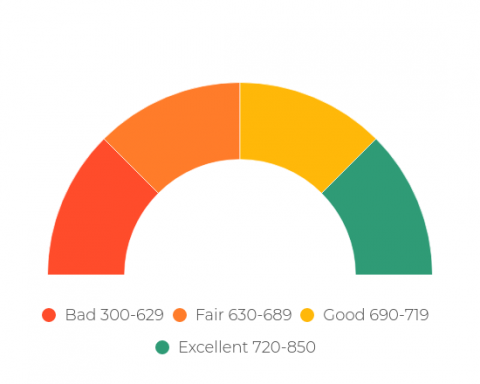 What is a good credit score? For both VantageScore and FICO scores, the data used in calculating credit scores comes from the bureaus, and the most important factor is on-time payments. Data from April 2018 show the average FICO score was 704. Less than 20% of scores fell below 600; 22.6% were between 600 and 699, and 58.2% were 700 or above. The average VantageScore 3.0 in the second quarter of 2017 was 675, according to credit reporting agency Experian. Because FICO and VantageScore consider the same factors, the scores generally move in tandem; a good score with one is predictive of a good score with the other. Even if your score is in the low 500s, you may still be able to get credit, but it will come with very high interest rates or with specific conditions, such as depositing money to get a secured credit card. You may have to pay more for car insurance or put down deposits on utilities. As you add points to your score, you’ll have access to more credit products. But as you add points to your score, you’ll have access to more credit products — and pay less to use them. For instance, someone with FICO scores in the 620 range would pay $65,000 more on a $200,000, 30-year mortgage than someone with FICOs over 760, according to data gathered by Informa Research Services. » MORE: Is your credit score high enough to to get a decent car loan? At the other end of the scale, borrowers with scores above 750 or so have many options, including the ability to qualify for 0% financing on cars and 0% interest credit cards. It’s important to know where you stand, so it pays to monitor your score. You can get a free credit score from a number of personal finance websites, including NerdWallet, which offers VantageScore. The important thing is to use the same score every time you check. Doing otherwise is like trying to monitor your weight on different scales — or possibly switching between pounds and kilograms. Some sources may be using a different scale entirely. Pick a score and stick with it to track improvement. And be aware that, like weight, scores fluctuate. A score is a snapshot, and the number can vary each time you check it. As long as you keep it in a healthy range, those variations won’t have an impact on your financial well-being. When you go to borrow money, a good credit score does not guarantee a good interest rate — or even approval. Credit scores look at your reported credit history to gauge the likelihood that you will repay borrowed money; you can be deep in debt and still have great credit scores if you have paid all your bills on time. Your income and other debts play a key factor in some lending decisions, as lenders consider what you owe alongside what you earn and assets you have accumulated. But your credit reports don’t reflect whether you can afford to repay the credit you are applying for. That’s why your income and other debts play a key factor in some lending decisions, as lenders consider what you owe alongside what you earn and assets you have accumulated. Lenders use a debt-to-income ratio calculation to evaluate whether you can repay a loan.